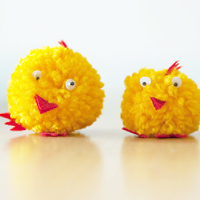 What better way to keep the kids occupied these School Holidays than with some Easter craft! Tap around the circumference of the small end of an egg with a spoon to crack it. Remove top and empty egg. Clean shells with hot water (no soap), air dry and place in egg carton. Repeat with the rest of the eggs. (Save the egg to make omelets later!) To reduce mess, cover egg carton beneath shells with thin towels while adding soil. Scoop planting mix into eggshells. A funnel made from a piece of scrap paper will neatly guide soil. When egg is nearly full of soil, use tweezers to gently place a seed or seeds in the center just below soil surface. When all seeds are “planted,” remove thin towel. Cover carton below shells with aluminum foil to protect it from watering mist. Place in a sunny, warm window and gently mist daily removing foil so it doesn’t overheat. Follow the seed packet’s guidelines for planting instructions and sprouting time. 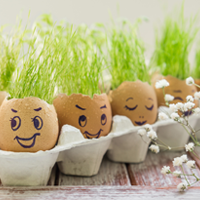 Tip: Don’t color the eggshells; dyes could harm seedlings. Paint the carton or add printed tags instead. Wrap the wool around the outer two prongs until it gets really thick. Cut the end of the wool. Using a new small piece of wool, bunch the looped wool together and tie it really tight to secure it. Do this in the middle of the pom pom in between the prongs to make sure it’s central. Take your wool off the fork and cut all the loops on either side. Be sure to get them all! Then trim all the extra long straggly bits so your pom pom is nice and round. Using a fine comb you can fluff the ends to make it appear softer. Cut out beaks, combs and feet. Glue googly eyes and cut out beaks, combs and feet.